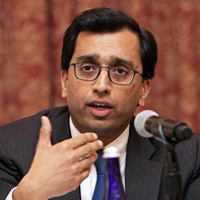 Rajesh De is a Distinguished Fellow and serves on the Board of Advisors of the Reiss Center on Law and Security at NYU School of Law, focusing on cyber governance. De is also a partner in Mayer Brown’s Washington, DC office and leads the firm’s global Privacy & Security practice. Most recently, De served as General Counsel for the United States National Security Agency (NSA). Prior to his service at the NSA, De served in the White House as Staff Secretary and Deputy Assistant to the President of the United States. De started his career at DOJ, where he was a trial lawyer in the Antitrust Division under the Attorney General’s Honors Program.